You can't miss with a 38,000 sq. ft. indoor waterpark! 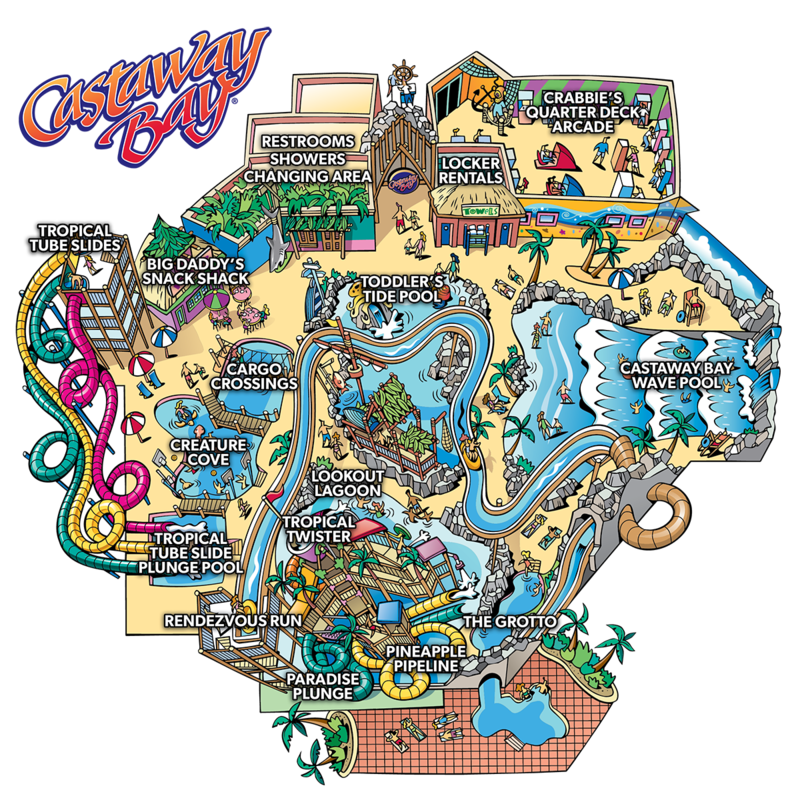 With everything from the thrilling plunges and twists of the Tropical Tube Slides, Pineapple Pipeline to splish-splashin' fun of the Toddler's Tide Pool, Castaway Bay has something for everyone to enjoy. So, relax. And welcome to the islands. 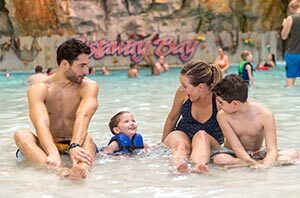 It's a tidal wave of fun at Castaway Bay Wave Pool. Float or body surf in this large pool with depths ranging from zero to five feet! Guests 48" tall and under must wear a life vest. Guests 42" and under must wear a life vest and be accompanied by a supervising companion. Hand-held infants may only participate in less than one foot of water if accompanied by a supervising companion and wearing a life vest. Try your best at crossing our splashtastic pool with bountiful treasure and precious cargo below! Use the hanging nets and floating treasure chests to make your way across. Guests must be 46” tall or accompanied by a supervising companion to participate. All guests less than 52” must wear a life jacket. Play your favorite pool games in our interactive pool with floatables and basketball hoops. The water is four feet deep. All guests less than 46” tall must be accompanied by a supervising companion. All guests less than 52” tall must wear a life vest. Slip and slide down these three single rider enclosed serpentine body slides and splash down into a 40” splash pool. Must be a minimum of 46" tall in bare feet to ride. Weight must not exceed 300 lbs. Access to tower requires guests to walk up 64 steps. Kiddos will love this interactive water playground with slides, water pipes, spraying gadgets, and sea creature play structures. Water depth is 18”. Must be under 52” or accompanied by a child. Bring your bestie to this water coaster that will launch the both of you uphill using water jets in a two-person boat. Water depth is 6”. Access tower to requires guest to walk up 59 steps. Maximum recommended weight limit is 250 pounds per person or 400 pounds per boat. Check out this huge interactive play structure for little ones for splish-splashin’ fun including a giant tipping bucket, sprayers, tipping pails, net crawls, rope bridges, and four body slides. Water depth is between 0” – 6” deep. Some slides have varied height requirements anywhere between 36” and 40” depending on slide. Step in, relax, and melt your worries away. This 50-person spa contains a waterfall and all the relaxation of the Caribbean. Water depth is 0 - 36”. Must be 16 years of age to participate in this attraction or accompanied by a guest 16 years of age or older. Handheld infants are not permitted in the spa. Please observe reasonable time limits.